Heroku ChatOps uses the power of Heroku Pipelines to bring a collaborative deploy workflow to Slack. Heroku ChatOps also provides some additional features over a traditional Heroku deploy. When you deploy using Heroku ChatOps, we’ll check the commit’s status checks on GitHub to ensure that you’re only deploying code with passing tests. We’ll also notify GitHub that your code has been deployed so that your pull requests will have a record of successful or failed deploys. Installation and setup of Heroku ChatOps requires Slack permissions to add and approve apps. More information on Slack app management is available here. Since Heroku ChatOps is built around pipelines, your applications need to be in a pipeline to take advantage of ChatOps features. To use Heroku ChatOps, you need to sign in to Heroku and GitHub. 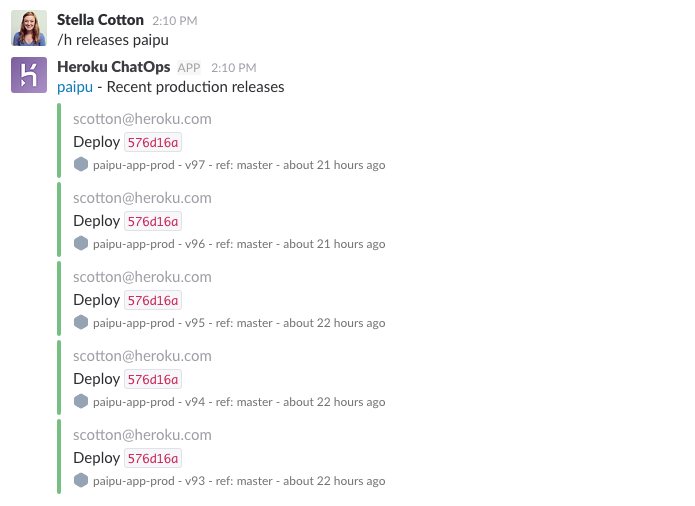 Any permission you have in ChatOps comes directly from the permissions you have in Heroku and GitHub. If you’re either the owner or a collaborator on an app, you have all the required permissions to use ChatOps on that app. If you’re member of a Heroku Enterprise Team, you need to have the deploy permission to use ChatOps on an app. If you’re either the owner or a collaborator on the GitHub repository that is linked to your pipeline, you have all the required permissions to use ChatOps on that pipeline. If you’re member of a GitHub Organization, you need to have the write permission to use ChatOps on that pipeline. There are two ways to deploy your code to an app using Heroku ChatOps, the deployment flow or Pipeline promotions. 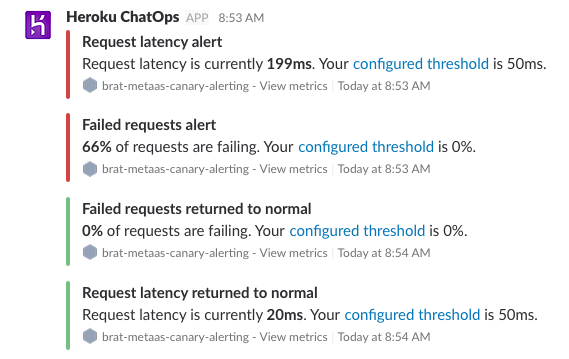 With both deploys and promotions, we’ll use Slack threads to provide updates along the way, from when the deployment or promotion starts, to when your last dyno has finished restarting. If you try to deploy an app when a status check is failing , it will refuse to deploy. You need to force the deployment using deploy!. Pipeline promotions have a few additional benefits over manual deployment workflows. For example, they ensure that a release to production contains the exact same compiled code as a release to staging, and promotions will also be faster than recompiling the slug. By default, it will promote from staging to production. You can also specify an upstream stage. It will promote from the specific upstream stage to production. If you have multiple apps in your upstream stage, you’ll need to specify a source app to promote from. If you have multiple apps in the downstream stage, you’ll need to specify which downstream app you’d like to promote to. Or you have multiple apps in the downstream stage, you can also specify a list of target app separated by a comma. Or another way to promote to multiple apps in a downstream stage is by specifying that you’d like to promote to all downstream apps. If you try to promote an app without having successful status checks, it will refuse to promote. You need to force the promotion to bypass the check. You can view the latest code deploys and configuration changes for the default stage. You can also specify a stage, like staging or production. You can obtain a list of deployable pipelines. 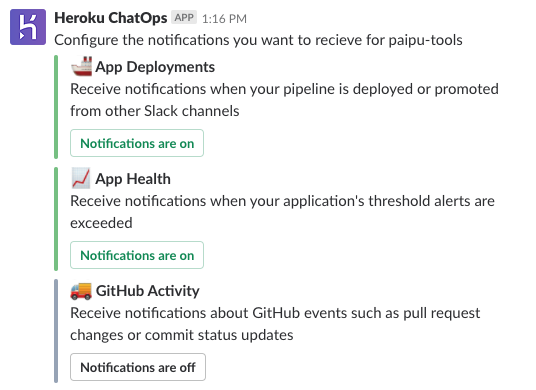 If you’d like to be notified about pipeline events, like a pull request opening, a Heroku dashboard deploy or promotion occuring, or your CI tests passing, you can route notifications to any public Slack channel. Pipeline notification routing currently only supports a single Slack channel. Pipeline events initiated from the CLI are not displayed. You can also disable notifications for a pipeline. Receive notifications when your pipeline is deployed or promoted from other slack channels. You’ll still receive updates inside the channel where you run the Heroku ChatOps command. 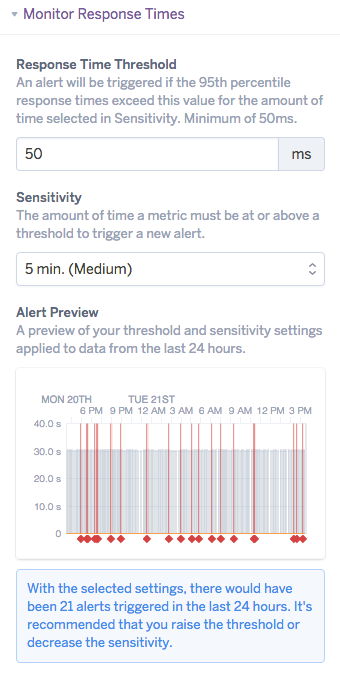 App health threshold alerts allow you to monitor application health by sending a notification if the p95 response time or error rate for your app’s web dynos exceeds your configured threshold setting for a specified period of time. Once you have a pipeline routed, you’ll can receive Threshold Alert notifications for any alerts configured for pipeline apps. Alert monitors are configurable in Application Metrics. Within Slack you’ll see receive a notification for the alert and when app health returns to an acceptable state. Clicking on the message links will take you to Application Metrics for further investigation or to adjust alert threshold settings. Receive notifications about Github events such as pull request changes or commit status updates. ChatOps does not support routing notifications to private Slack channels or teams using Github Enterprise. What permissions does ChatOps require? Heroku account permissions: when you /h login to connect your Heroku account to Heroku ChatOps, it asks for the following permissions: Read and write access to all of your account, apps and resources. Those permissions are required to perform operations such as listing your pipelines and deploying or promoting an app. GitHub account permissions: when you /h login to connect your Heroku account to GitHub, it asks for the following permissions: access to your account, your public and private repositories. Those permissions are required to perform operations such as checking status checks on commit statuses or creating deployments on a Pull Request. Can I limit the Heroku Apps or GitHub repositories that ChatOps has access to? Heroku ChatOps allows you to control any Heroku app that you personally have access to but there are no finer grained controls beyond that. It also does not allow other people in your Slack to control those apps unless they also have permission to access the apps. GitHub Apps allow for finer grained control on repositories, but that has not been integrated into Heroku ChatOps yet. We cannot commit to a timeline but it’s definitely on our radar. Keep an eye on the Heroku Changelog. Does Slack have access to my GitHub or Heroku account? No, only Heroku ChatOps has access to your GitHub and Heroku account. Your GitHub access token and your Heroku access token are never shared with Slack. Why do I get this “Please make sure you have access to this GitHub repository" error? Please make sure you have access to this GitHub repository. Read more about permissions and try to sign in to GitHub again. Normally that error gets triggered when the user’s GitHub token gets a 404 accessing the connected repository. In some cases, tighter restrictions on the GitHub side can make it so a configured pipeline is unable to be accessed by a user in ChatOps. It appears that permissions are likely not correct. in Slack, type /h logout then /h login. Connect your Heroku and GitHub accounts then try again. make sure that the GitHub user has Admin privileges in the GitHub UI > repository_name > Settings > Collaborators & teams for the repository. visit the OAuth Application authorizations in https://github.com/settings/applications > Authorized OAuth Apps > Heroku ChatOps and make sure the appropriate Organizations have a green checkmark.